) and as a result, I tend to spend a lot of time hanging out in the #BloggessPals hashtag on Twitter just to be with my peeps. and how relaxing and fun it is to play. I’ve been playing Stardew Valley for a while on PC. It’s a farming roleplay game in the vein of Harvest Moon, in which you inherit a farm from your grandfather and decide to settle down away from the hustle and bustle of city life and the grind at the Evil Megacorp you work for. It combines farm-sim gameplay with a lovely storyline, quests, and interesting characters to meet (and romance) in the village. It’s LGBT inclusive – you can romance all of the romanceable characters no matter what gender you choose for your character – and my one and only complaint about it is that it is very white. There are only two POC characters in the village, a scientist and his tinkerer daughter. This is, however, easily correctable with mods (which are only really available on the PC at this juncture). Modding is a regular feature I enjoy particularly in these sorts of games to increase the options you have for things to do. And, well, I like to tinker. There is a somewhat clunky combat system in the game and creatures to fight in the mine, but you can avoid combat entirely if you want to, and the combat is hardly challenging if you do decide to partake. I spend most of my time in the game farming, fishing, and trying to collect items to rebuild the village’s community center. 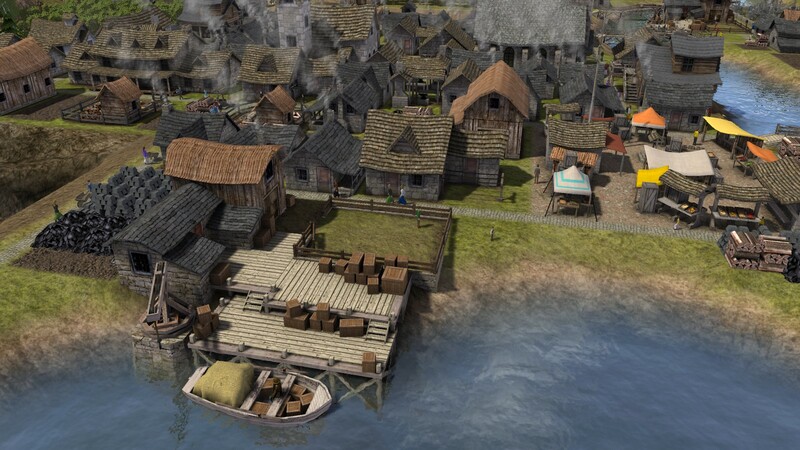 Banished is a rare game that I love so much I have bought it twice – on Steam and on GOG.com. It was created entirely by one man on his own, and I have likely played more hours of this than any other game over the last couple of years, usually modded with the Colonial Charter mod that is very nearly an expansion pack for the original game. It’s a city-builder with no combat or competition from other players or the computer, your only goal is to help your village survive. That survival can be surprisingly difficult, as you have to pace your population expansion to ensure you don’t run out of food but while also maintaining enough growth to sustain the village, as your villagers will age and die over time. The means of doing this is by building – or not building – houses for young couples to move into and start reproducing. Disasters can be enabled or disabled in your options when you start a game. There’s a lot of waiting in Banished. You don’t want to do anything too fast, and so it leads to a very relaxing, almost zen-like meditation as a game experience. I’ve had Banished pull me out of a full-on panic attack, it works so well. There’s another use I’ve found for Banished that I call “Playing Productivity Banished.” I have Adult ADD, among other things, which gets worse when my depression or anxiety are bad, and I’ve found that if I can distract that part of my mind that won’t shut up, the other part of my mind will be able to focus and get things done. I do this by running Banished in the background behind my work, positioned so that I can see a sliver of the window, where I keep the progress meters for any buildings I am currently building. I do my work while my builders are busy doing their work, only building one building at a time (a pacing method that helps keep you from building faster than your village can sustain). When they finish a building, I start them on another, put the meter where I can see it, and pull back up my own work and work some more. It’s like the Pomodoro Method, but with Banished buildings. And it works. I get so much more done when I use this and I am less likely to get distracted by the internet or social media. It’s a distraction, sure, but it’s a controlled distraction that actually helps me focus instead of keeping me from getting things done. It’s odd to say “This game makes me fall asleep” as if it’s a feature instead of a complaint, I know, but it is actually one of the things that I enjoy about playing Skyrim. To anon-gamer, it might seem odd that a game that consists of playing as a Viking Lady (or dude, I don’t judge) Fighting Dragons is relaxing, but it really, really is, and at this point Skyrim and Tamriel are as familiar to me as my own home. There is a lot of repetitiveness in Skyrim, which helps the “relaxes me until I fall asleep” aspect of the game, but it’s not boring and it can be challenging (at least until you’ve leveled your character up into an overpowered super-creature, at which point even hard mode isn’t hard). I’m not sure I can precisely explain why Game I Find Extremely Fun can also be Game That Puts Me To Sleep. I don’t do any major quests while trying to defeat insomnia, nothing that will get me too engaged in what’s going on, so maybe that’s it. The music is beautiful and soothing, even when I feel like crap. All I know is that I realized at some point that if I’m having trouble sleeping, I can lay on the couch and play Skyrim for 30 minutes or so and suddenly I’ll find myself waking up, controller in hand, as my console is about to shut down from inactivity. It just works.